The existing BETO-funded membrane program laid the ground work on new membrane materials and process development. The novel materials-based membranes become a keystone to further advance of membrane separation technologies and provide support to the mission applications of the separations consortium. The membranes capability supports the consortium tasks in organic acid carbon recovery, in improving the bio-oil feedstock for upgrading, and in preserving catalysts. Description ORNL develops a new class of surface-engineered (superhydrophobic or superhydrophilic) nano/meso/micro-porous membranes that can be tailored for high permeation flux, high selectivity, and anti-fouling separations performance. The R&D 100 Award-winning membranes are either inorganic (ceramic or metallic) porous materials based, or supported polymer or polymer-graphene coated membranes. They can be tailored for either liquid phase separations (emulsions, chemicals, or dewatering/deionization) or vapor phase separations (such as for the hot pyrolysis vapor processing for production of biofuel and value chemicals). The separations with the tubular membranes platform can be operated in continuous cross-flow separation mode. In addition, nanocatalysts can be deposited on the membrane tubular platforms to serve as membrane reactors for high-yield reaction processing. Limitations The planar or tubular membrane platforms (either single-tube or multi-tube modules) can be fabricated and bench-scale tested at ORNL or at the industrial lab settings. The multi-tube module is proven a scalable, mechanically rugged, and high-temperature tolerant assembly system. ORNL has the inorganic membrane fabrication center, the nanomaterials engineering and functionalization research laboratory (4500N, Lab A09), and is the home for DOE user facility Center for Nanophase Materials Sciences (CNMS) for advanced materials characterizations. ORNL has past experiences to support industrial R&D to solve practical separations/catalysis problems. 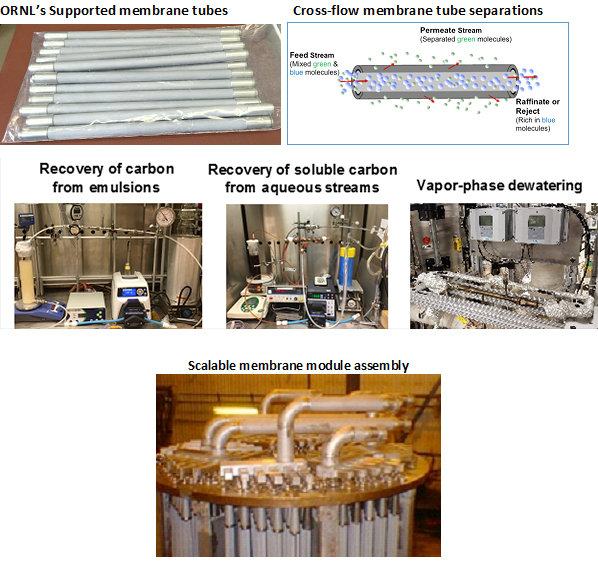 ORNL work with NREL for a real-time MBMS-monitored membrane vapor separation test facility. Superhydrophobic/superhydrophilic coatings expands to broad applications. Availability We are open to work with industrial partners for government-funded projects or industry-sponsored projects. We can evaluate industrial separations problems using ORNL’s in-house bench-scale testing facilities including membrane filtrations, membrane pervaporations, membrane distillations etc. We can also fabricate membranes and modules and deliver them to industrial lab for their testing on site. M. Z. Hu* and M.R. Sturgeon, “Architectured Nanomembranes,” invited contribution to a chapter for book Shape Selective/Anisotropic Nanomaterials, July (2017). M.Z. Hu*, C. Engtrakul*, B.L. Bischoff, G.G. Jang, T.J. Theiss, M.F. Davis (2016). “Superhydrophobic and Superhydrophilic Surface-Enhanced Separation Performance of Porous Inorganic Membranes for Biomass-to-Biofuel Conversion Applications.” Separation Science and Technology, pp. 1-16, http://dx.doi.org/10.1080/01496395.2016.1260144. C. Engtrakul*, M.Z. Hu*, B.L. Bischoff, G.G. Jang (2016). “Surface-Enhanced Separation of Water from Hydrocarbons: Potential Dewatering Membranes for the Catalytic Fast Pyrolysis of Pine Biomass.” Energy & Fuels, 30, pp. 8343-8348. US Patent 9,308,501 B2, “Super-surface selective nanomembranes providing simultaneous high permeation flux and high selectivity”, Date of Patent: April 12, 2016. Inventors: M.Z. Hu, J.T. Simpson, T. Aytug, M.P. Paranthaman, M.R. Sturgeon. U.S. Provisional-Patent Application (on January 25, 2016), Application No. 62/286,65; Title: Integrated Membrane-Pyrolysis-Catalytic Upgrading Systems; Inventors: M.Z. Hu, B.L. Bischoff, C. Engtrakul, M.F. Davis.